Sen. LaSata chairs the Appropriations Subcommittee on Universities and Community Colleges. Prior to joining the state Senate, LaSata served one term in the state House of Representatives from 2017-2018. 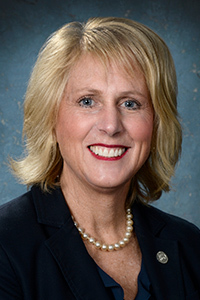 Before serving in the Legislature, LaSata was a school teacher in the Lake Michigan Catholic School system, her alma mater. She was selected as Teacher of the Year in 2015. She has also served in several community organizations, including as past president of Berrien County Guardianship Services Inc., Women’s’ Service League, Capstone Center and as vice-chair of Child and Family Services. The senator holds a Bachelor of Science in Education and a Master’s in literacy studies from Western Michigan University. She and her husband Charlie, and their four children, live in Bainbridge Township. Senator LaSata can be contacted by clicking here.